Attention science buffs: Edith Hope Fine’s biography of groundbreaking geneticist Barbara McClintock (1902-1992) is available free on Kindle this weekend, June 16-17! As we mentioned back in April, Barbara McClintock: Nobel Prize Geneticist is a lively biography for readers nine and up, illuminating the life and work of this remarkable scientist. Dr. McClintock won the Nobel Prize in 1983 for her discovery of “jumping genes,” small pieces of DNA can move from one place to another in a genome. She conducted most of her research on maize, working with crops she raised herself. Melissa Wiley: What inspired you to tell Dr. McClintock’s story? Edith Hope Fine: I’d known about Barbara McClintock through my friend Margaret MacVicar who taught at MIT. When the opportunity came up to write about McClintock, I grabbed it. I dedicated the book to Margaret — she died in 1991 and all of us still miss her. MW: Can you tell us about your research process? EHF: The internet was in its infancy and of little help. 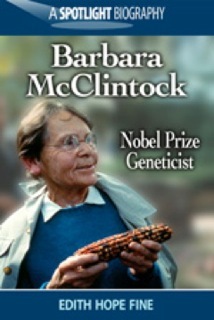 Today you can search for Barbara McClintock and all sorts of cool things come up. It was amazing to me to find a link that we included in the book showing Dr. McClintock walking toward the king of Sweden at age 81 to receive her Nobel (first woman to win an unshared Nobel in Physiology or Medicine). Back then (mid-’90s), I went to the American Philosophical Society, right across from the Liberty Bell in Philadelphia, to explore their archives. That’s the sort of place where the only thing you take in is a pencil, a pad, and maybe a piece of Kleenex. (Today, could I take my iPad with its built-in camera? I doubt it.) I held her honorary degrees and old family photos in my hands, and marveled at the 3 x 5 cards on which she kept her meticulous records. I also traveled to Cold Spring Harbor on Long Island where the archivist, Clare Clark, and others were so gracious in helping me gather information. Geneticists there helped me make certain that although I couldn’t dig too deeply into her complex discoveries, what I presented for young readers was both clear and accurate. In New York, her niece kindly gave me the photo of Barbara McClintock sitting at the front of her first-grade classroom and you can see at the back of the room her name is on the honor roll written on the big chalkboard. A friend in my critique group checked the genetics, too. All that support was invaluable. MW: What’s the most interesting thing you found out about Dr. McClintock? EHF: I loved learning about Barbara McClintock as a person. She had a dry, wry sense of humor. She loved the color red. She was so supportive of younger geneticists, encouraging them, providing them with maize seeds (kernels), working out problems with them. Her neighbors told me how walking with her around Cold Spring Harbor was remarkable — she’d collect black walnuts for making her famous bread, and she’d point out the one red flower in a field of white — another example of transposons, “jumping genes,” her discovery. There’s a great photo in the book of her at a birthday party soon after returning from receiving the Nobel. She’s wearing Groucho glasses so as not to draw attention away from the birthday honoree. She was self-effacing, sure-footed in her science, and perhaps the hardest worker I’ve known about. Barbara McClintock is such a great role model for young women in terms of persistence, intellect, drive, and a grand curiosity that fueled all her research. MW: I enjoyed reading about the book’s journey to digital form at the eFrog Press blog. Do you have other ebook plans in the works? EHF: We’ve dubbed this eBook series Spotlight Biographies. Quite a few of us have done well-received biographies that have since gone out of print. We’ll be adding to the series to shine the light on other remarkable individuals who can be inspiring to young people. I have another title, Nitty Gritty Grammar , that is already an ebook. We writers are in the middle of a revolution in the publishing business — kind of fun to straddle both worlds. (I just signed a contract with Random House Children’s Books for a sleepytime book for littles to be published, yes, as a book book!) in 2014. I do have other e-ideas, but they’re at the idea stage. In the spirit of this tireless researcher, learn chemistry using pennies, understand more about math by making paper plate models, apply the scientific method at the grocery store, and use light to make your walls into examples of geometry. As for a celebratory dinner? Summer corn, of course.